The Business and Human Rights Resource Centre (BHRRC) reports ongoing abuse of Syrian refugees working for the Turkish garment industry. The Britain-based charity surveyed and inspected 37 major European brands with Turkish factories in their supply chains on the policies and practices undertaken to tackle exploitation. The UK-based Business and Human Rights Resource Centre (BHRRC) reported that some of Europe's biggest clothing stores were failing to stem abuse against Syrian refugees who work in Turkish factories. 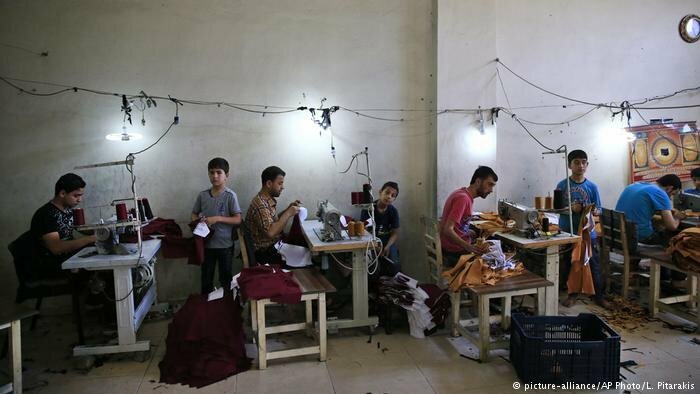 Exploitative conditions including low wages, discrimination and poor conditions were common for Syrian refugees working in Turkey's multi-billion dollar garment industry, where child labor was also reported as a problem, according to the BHRRC. The report said that an estimated 650,000 Syrian refugees out of a total of more than 3 million, who had fled their home country to escape war, had found a lifeline working in Turkey - with many working in the garment industry. The BHRRC says it approached 37 brands with questions on their actions to protect Syrian refugees in their supply chains, followed by visits to Turkey in July and August 2017 in order to assess recent developments and speak to people on the ground. The resulting report revealed that while some brands such as UK-based New Look, Next and SuperDry as well as Spanish label Zara were judged to be taking sufficient action against exploitation, others showed little evidence of action to stop exploitation of refugees and delivered insufficient information when approached by BHRRC. Brands with questionable practices and limited responses included Aldi, Arcadia Group (which houses UK brands like Topshop and Dorothy Perkins) and the UK supermarket-chain Asda. Other companies including the German brands Hugo Boss, New Yorker, Mexx, and s.Oliver as well as British Brand River Island failed to respond the BHRRC to the survey altogether. "Some high street fashion brands (...) have made progress in protecting workers, but too many, like Aldi, Asda and Topshop, are lagging way behind," Phil Bloomer, executive director of the BHRRC, said in a statement. "They should learn from the leaders, and quickly." The charity said more brands had boosted efforts to clean up their supply chains compared to last year, with the top performers establishing plans to protect refugees, mechanisms to handle complaints, and initiating dialogue with workers' groups. With most workers reportedly lacking work permits, the BHRRC said that many refugees were left being exposed to a greater risk of abuse. The chairman of the Istanbul Apparel Exporters' Association, which represents about three-quarters of Turkey's clothing exporters, said that Syrian refugee workers holding work permits were protected by the country's "very strict laws" on working regulations. "Portraying a few exceptional cases that could happen even in the most developed countries around the world as Turkey's reality is not befitting of fairness and good intentions," Hikmet Tanriverdi told the Reuters news agency in a statement on Friday. A Reuters investigation last year, however, had found evidence of Syrian refugee children in Turkey working in clothes factories under illegal conditions. Turkey bans children under 15 from working. The BHRRC recommended that brands needed to change their purchasing practices to avoid encouraging an environment of abuse.